In specialty crop growing, the upright fruiting offshoots (UFO) system, is more common in sweet cherry production, as its favors mechanization and can optimize orchard efficiencies. But, UFO production is less likely in peach production, where growers favor open-vase growing systems. 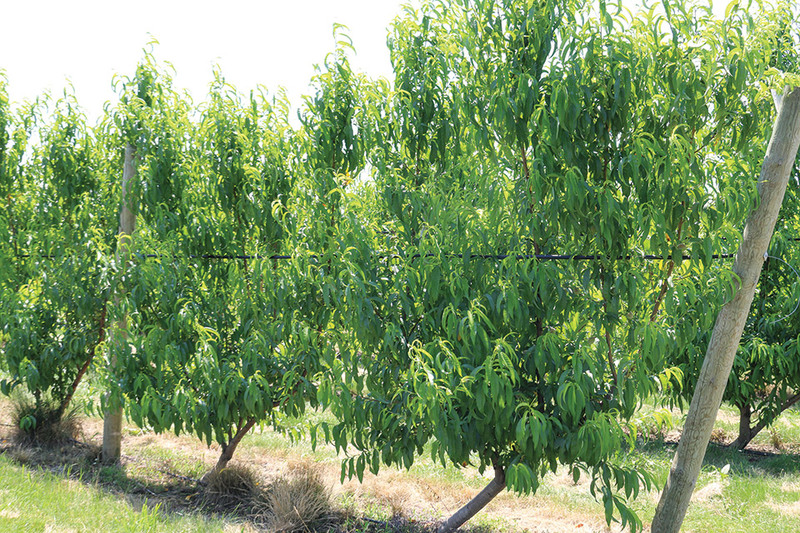 Some of that favor with open vase systems comes with growers’ fear of bacterial canker from rubs of any trellising that might be used in a high-density peach system. A father-son duo in Michigan is using this UFO system to lower labor costs and open up the potential for future mechanization. They’re in the fourth leaf of a block with varieties from ‘Early Glo’ to ‘PF-23’ at Windy Ridge Orchards in Conklin, MI. 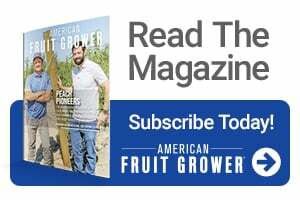 Kyle Rasch, a sixth-generation fruit grower on the Ridge, spoke about his family’s UFO system at the 2017 International Fruit Tree Association’s summer tour, but he’s quick to point out that the planting was not his idea but his dad’s, Chuck Rasch. Kyle says he was slightly surprised at his dad’s interest in moving toward something so innovative. Renewal is the name of the game in peach production, and Kyle says this UFO system lends itself to renewals. And, growing a peach is unlike any other type of tree. 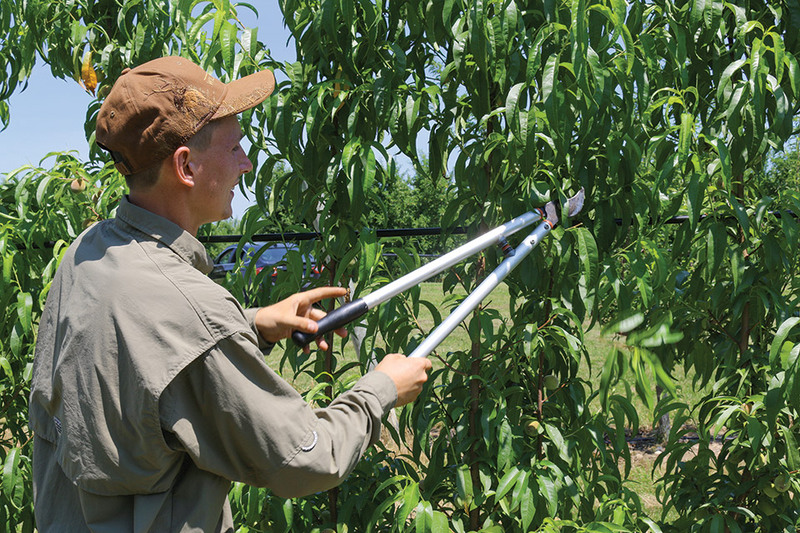 Pruning is used to promote growth and fruiting buds to prevent the peach tree from growing too much blind wood. Trees in the Raschs’ system are at a 12-by-10-foot spacing on 2.5 acres. The Rasch family worked with Greg Lang of Michigan State University, as they’re entering into new territory with high-density peaches. Trees were laid down and limbs were allowed to grow up naturally. While that’s an economical approach to get the upright shoots, it may not have been the best approach in the long run, Kyle says. “We’re paying for it right now because of all the trimming that has to be done,” he says. For growers considering UFO peaches, it’s best to find 10 leaders per tree that are similar in size and get them established growing upward. Kyle says you’ll be much happier with the early attention to detail. “That’s probably where we’re losing some of our yields too because we don’t have the 6 leaders per tree like I would like, we only have 3 or 4 on average. Getting the leaders set is going to be the biggest point we’re going to emphasize,” he says about the next UFO planting. While many growers may fear bacterial canker, Kyle says his family hasn’t noticed any bacterial canker, but they decreased the risk by covering the trellis wires. “We haven’t seen any canker,” he says. “As far as the trellis, we put irrigation tubing over top of the wire to work as a protective measure for that. He wonders if inoculum for canker is down in that block, too, but he’s sure covering the trellis wires helps protect as well. 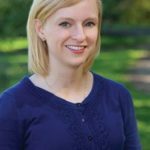 So, why consider the UFO training system in the first place? Well, it comes down to an interest in reducing labor expenses while increasing the consistency in peaches. Kyle says the fruit is more uniform. The Raschs were also able to mechanically hedge twice this summer. However, Kyle is quick to point out that the trees needed some help with shaping, so more labor was funneled into getting the tree structure right. But, that’s where if more time is taken in the initial establishment of the UFO system, the labor costs may come into play. While the original planting may need some extra attention, Kyle says they plan to plant more UFO peaches soon. Kyle says the one thing that’s for sure is that his family will be spacing plants closer in the future to help boost returns. “Always have the willingness to go closer, because that’s where you’ll pick up your yields,” he says.